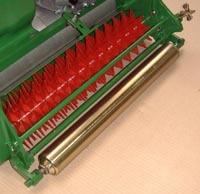 The vertirake has been developed to remove laterally growing grasses and general debris to help promote healthy growth. It consists of hardened discs spaced 19mm apart. Height adjustment us via the normal front roller adjuster. It can be easily fitted and removed and is adjusted to suit ground conditions.